For Estacada resident Raeline Kammeyer, the Clackamas County Fair is a family tradition. Kammeyer began attending the event as a child with her parents and siblings and showed animals. Her nieces and nephews later continued the tradition. Kammeyer, who has spent a decade on the Clackamas County Fair's Board of Directors, was honored as the Oregon Fairs Association Fair Board Member of the Year earlier this month. Kammeyer said receiving the award was "quite a surprise and honor." "There are so many people out there that are deserving," she added. A press release about the award praised Kammeyer's positive mindset and willingness to help with a variety of projects. "Raeline is not afraid to get her hands dirty," the statement read. "She attends the fair every day with an upbeat and cheerful attitude asking what she can do to help; no job is too menial for her to tackle." The Clackamas County Fair Board meets monthly and is responsible for the financial and business management of the fairgrounds in Canby. The weeklong Clackamas County Fair dates back to 1907 and features livestock exhibits and competition, local crafts and produce, live entertainment and a rodeo, among other activities. "It's a country feel," said Kammeyer, who also manages her family farm on Springwater Road. "It's not like the asphalt world of expo. It's green with trees and picnic tables." Kammeyer's earliest memories of the fair are of the sense of community the event facilitates. "It was almost like a reunion. I remember dad saying, 'There's so and so, let's talk to him,'" she said. 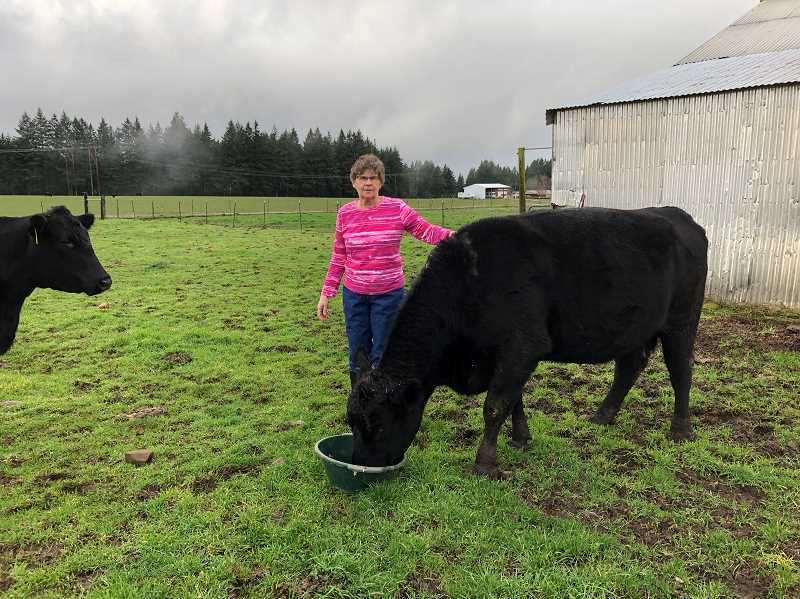 After graduating from Oregon State University, Kammeyer taught agriculture in the Estacada School District for 22 years, where she found a community spirit that extended to the fair. As an adviser for the Estacada FFA program, she would often camp with students at the fairgrounds rather than make the commute from Estacada to Canby each day of the event. The animals students brought to the fair camped as well. Kammeyer joined the Clackamas County Fair Board in 2008 at the recommendation of a fellow agriculture teacher. She also serves on the Clackamas County Fair Improvement Foundation, which is working toward raising funds for a new barn. She compared being a member of the Fair Board to owning a small business. "You weigh options, find out what works and what doesn't and generate ideas," she said. Kammeyer and her fellow fair board members strive to integrate technological trends into their work. "We're adapting to smart phones and putting schedules online," Kammeyer said. "We have to stay up on the times and poll our grandkids." She noted that a variety of additional events take place at the fairgrounds each year. "It's not just the fair. We're a year round event center," she said, citing events like the gem and rock show, renaissance fair, dog show and a number of bazaars. "(The fair is) entertaining and teaches you something. There's 4-H demonstrations, showing animals, seeing photography and quilting, canning seminars," she said. "It's pretty exciting." She appreciates the skills the fair instills in children. "The responsibility a child learns by taking care of an animal, once that's established, it continues throughout their life," she said. "It lays the foundation that you take responsibility seriously." Kammeyer credits her family as an influence for her longtime involvement with the Clackamas County Fair. "My father was a rodeo hand, and he taught us that hard work will pay off. That's how I look at the fair. There's a lot of behind the scenes work to do," she said.